The link to the LCPD Database at the bottom of the LCPD website in GTA IV and its episodes. Searching the LCPD Database on a police computer. 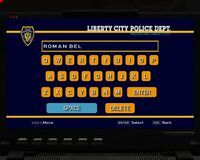 A police record displayed on a police computer after searching the LCPD Database. 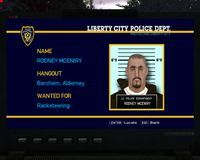 The LCPD Database is an online database of criminals that is found on the official website of the Liberty City Police Department in Grand Theft Auto IV. Many characters from the game are profiled in this Database, below is a list of the characters in alphabetical order (on the left) with their Hometown (on the right). A humorous detail about the site is that the LCPD haven't actually restricted the database to authorized people (with a password), but instead have a warning at the top of the page that it may only be used by the LCPD. There is also a less detailed version accessible from the police computer inside any police car. It should be noted that the characters list is not extensive. Not all characters featured in GTA IV are included despite some committing criminal acts prior; certain characters featured in DLCs for GTA IV, The Lost and Damned and The Ballad of Gay Tony may also be absent, presumably because the characters were only created during development of the DLCs, after the database list in GTA IV was finalized. Another important note is that the information in the database isn't always 100% accurate and may be out of date. After the mission Blood Brothers, if the player chose to kill Derrick McReary, Francis will send you an easy-to-access link to the database via e-mail, with the subject line "Those Who Have Strayed From The Path." Some but not all of the characters can be found in a police car's computer. This shows a mugshot, "Hangout" (always "Unknown") and "Wanted For". Names with an asterisk on this list can be found in the car's database as well. This page was last modified on 24 January 2014, at 21:22.